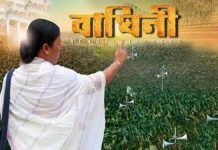 Kolkata, 10 April: CHIEF Minister and Trinamool supremo Mamata Banerjee today called on the Prime Minister Narendra Modi in a one to one meeting at the latter’s official residence in New Delhi. The meeting between Banerjee and Modi comes after a gap of about eight months and coincidentally, at a time, when the CBI has intensified its probe in the multi-crore Saradha and Rose Valley chitfund scams in which two Trinamool MPs are currently under arrest. 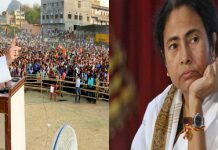 At the direction of the Supreme Court, the Central agency is also probing alleged bribe taking by several Trinamool leaders as had been exposed by the Naradandews Sting. Banerjee drove in to the Prime Minister’s residence around 9.20 this morning, and the meeting began at 9.30 am. The meeting ended after about half-an-hour, and Banerjee then drove straight to the Parliament for meeting senior Congress leaders like Ghulam Nabi Azad, Ahmed Patel. 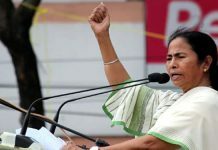 Before entering the Parliament building, the Chief Minister told journalists that she has only spoken to the Prime Minister about releasing Rs 10,459-crore that is due to Bengal as Centre’s share to various welfare schemes and development projects. “I told the Prime Minister that we are already shouldering the huge debt burden left behind by the previous government and with the Centre not releasing Rs 10,459-crore, we are facing immense difficulty. He has assured to look into the matter,” she said. Asked whether she has discussed the Teesta water sharing issue with the PM, Banerjee replied in the negative. “We have not discussed Tessta. I only focused on the release of funds,” she said. The Teesta water sharing pact between India and Pakistan is held up due to objection from Bengal, and the on-going New Delhi tour by Bangladeshi Prime Minister Sheikh Hasina has so far failed to break the ice.